This page contains a net worth percentile calculator for the household wealth distribution in the United States in 2016 (newest data as of 2019). Enter net worth for a net worth percentile estimate, down to the closest .5%. Also see our analysis in the net worth bracket article. To divide by age, see the net worth percentile by age calculator. For income calculators, try: individual income and individual income by age. Net worth is the ultimate number to track for your personal finance. Net worth is your total value if you sold everything and paid off all of your debts. Tracking your net worth over time will put you on the road to financial independence or retirement. To calculate net worth, add up the value of every single one of your assets. That might include a home, a car, all checking and savings accounts, brokerage accounts, retirement accounts, and everything else that could be liquidated. Next, subtract the sum of all of your debts. This might include a mortgage, some credit card debts, your student loans, any personal loans, and other places you owe money. The result is your net worth. With that net worth in hand, compare yourself to the net worth of other Americans on this page. Want an easier way to track net worth? Personal Capital calculates your net worth and tracks it over time so you can see improvements at a glance. They’ll also offer advice on reducing fees and spending, as well as advise on investing and allocation. Who Are the One Percent in America by Wealth? The 1%, usually refers to the top 1% of income earners in the United States. We’re instead fans of using net worth – as our co-writer points out, it’s easy to convert net worth to income but not always vice versa. Net worth of over $10,374,030.10 would put a household in the top 1% with the 2016 data. Who are the .1% by net worth? At this point, you’re stretching the dataset quite a bit. We’ll provide a number, but please note that it is probably a couple million dollars away in either direction from the ‘true’ value. Roughly 125,981 households have the top .1% of net worth. More than $43,090,281.00 in wealth would put a household in the top .1% with 2016 data. Please also see our article on the one percent in net worth and income in America. However, for a quick cut, that’s what the data reveals. $1,000,000 in wealth is near the 88% in America. Around 15,117,804 households matched this bracket or more. $2,000,000 in wealth is around the 93.5% in America. Around 8,188,810 households or so matched this net worth or more. 93.5% – 88% = 5.5%. 5.5% * 125,981,700 = 6,928,993.5 or 6,928,994 households. If you’re interested in millionaire research, see our post on the number of millionaires in America. We look at millionaires, decamillionaires and many more breakdowns of this wealth data. To invest in private equity funds, angel funds, venture capital, hedge funds, , and other types of private investments an investor needs to be an Accredited Investor. In America, the most common way to qualify is through net worth, having a net worth of $1,000,000 not including equity in a primary residence. We estimate that of the ~12.4 million accredited investor households, around 11.3 million qualify just through the net worth criteria. Investors can also qualify through individual or household income. Here is our math on the number of accredited investors in America. 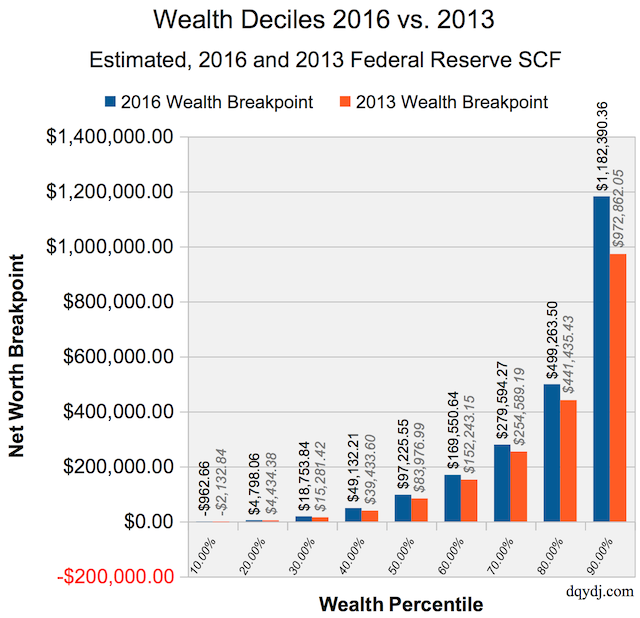 What Do We See in This Year’s Wealth Percentile Data? The data is perfectly comparable to the 2013 SCF data, and we’re happy to report that every single net worth bracket increased in wealth over the three years between surveys. Be careful not to draw improper conclusions – the data is not longitudinal, so we can’t state with certainty that individual households improved. However, the static data shows an improvement at every breakpoint. For research on millionaires, see our millionaires in America article. Our data comes from the 2016 Federal Reserve Survey of Consumer Finances. It encompasses 6,248 actual American households in the public set. Those households are spread across 5 sets with replicate weights, and weight to 125,981,700 households. We turn this into 200 quantiles, so wealth is estimated to the half percentage. See our article on wealth brackets for more details on methodology. Net worth numbers come from the Federal Reserve’s provided macro. We also make estimates ignoring primary home equity by taking the estimated value of the primary residence and subtracting from it all debts secured by the residence. This includes mortgages, home equity loans, and similar. Note: remember that if you sell a primary residence you still need to pay rent. We aren’t fans of this calculation method but we heard your arguments and built it into the tool. For research, information and estimation purposes, you can trust the numbers you see. For anything where you need more detail, run the numbers or go knock on some doors yourself. thanks for this! so the “without primary home” does include second homes, business equity as well as retirement and financial assets? Yes, the only thing it is removing is the value of a primary home minus any debt secured by a primary home. This will match it to the accredited investor math (which doesn’t count primary residence). We have plans to spin out asset allocations, for at least some wealth percentiles… but haven’t decided which ones (or when). Please keep an eye on the feed. Keep an eye on the feed for updates on the calculators, each one will be done in turn and we’ll publish a new post. We archive the old ones instead of updating as methodology changes and a number of readers like to look back at how things have changed. Any chance we will see an updated net worth percentile by age calculator off the 2016 SCF data?